Don't miss out. There's only 4 available and 18 other people have this in their cart right now. Don't miss out. There's only 1 available, and 18 other people have this in their cart right now. This listing is for a completely custom 3 1/2" Mommy & 1 1/4" Baby peg set made just for you or a special little momma in your life. 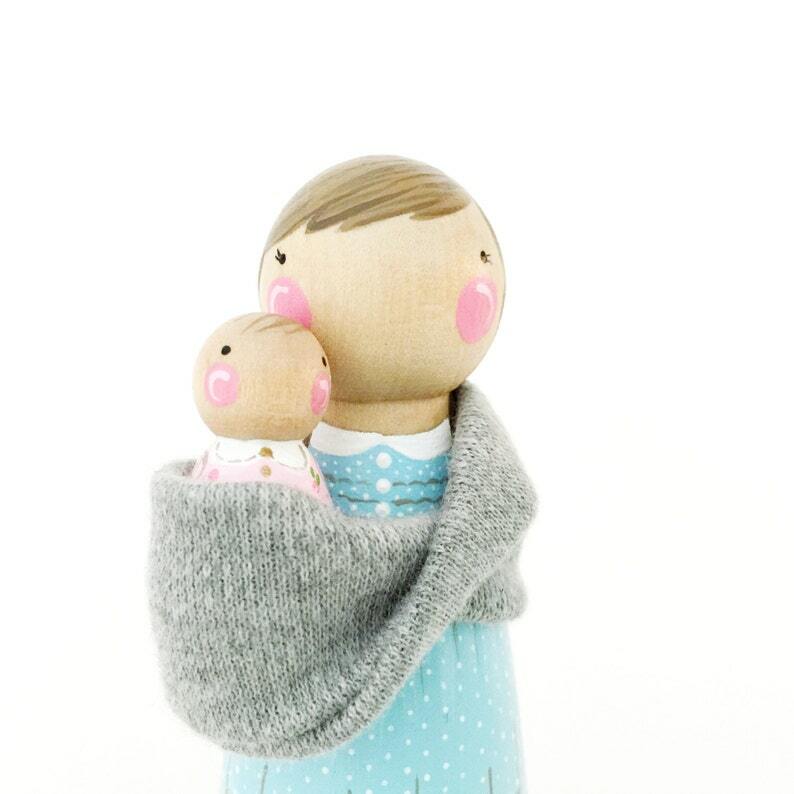 The set comes with a little stretchy sling so that the Mother peg can wear her little baby! The set in the photo is not for sale. It is a recent custom order that I painted for a sweet momma-to-be as a baby shower gift :) Perfect topping a cake, as a shower gift, decor in a little bedroom or in a dollhouse, I can think of many cute ways to use this sweet little duo! Would you like your own Mommy & baby peg set? Here's how it goes... You purchase this listing, send me ideas/photos/details of what you'd like for hair/outfitting/baby clothes and then I get to work!! This listing is for ONE 3 1/2" momma dress shaped peg (Although, feel free to request a daddy peg instead...daddies wear their babies too!) and ONE 1 1/4" baby peg. I use non toxic paint and sealer, so pegs are ready for regular play. Peg dolls are manufactured in the USA. The best. Everyone that sees them inquires as to where I got them. Amazing customer service. Ordering more soon. We purchased this for father’s Day and it was the perfect gift. Peg and plum where great at communicating and the dolls arrived when they said they would. My husband loved the doll family! Thank you!